Michaelson Homes, located in historic Milford, Ohio and serving the east side of Cincinnati, has developed a reputation for exceptional quality, creativity, and accountability. With almost 20 years of experience, the Michaelson Homes team specializes in new builds, renovations, and particularly loves a good creative challenge. Our skilled team of craftsmen creates custom-designed environments for every project – no two are ever alike. We strive to exceed expectations on every project. Our focus is on team building, rather than outsourcing, to create a consistent approach to each project that ensures a quality product, while building trust with our homeowners along the way. Sketches, an interior view LLC, is a full-service interior design firm serving satisfied residential and commercial clients in Cincinnati, the Midwest and beyond for twenty eight years. To combine your style with my experience in creating a great environment that fits your lifestyle is my primary goal. When a design project – no matter how large or how small – is completed, I want my clients to feel that I have listened to their needs and desires, worked within the budget, and made the process an enjoyable one. The scope of my service is as flexible as the needs of the client – whether it’s a one-time consultation, creating a design scheme for an existing space, a total remodeling project or new construction from blueprint to completion. I bring to my clients an extensive library of fine furniture, designer fabrics, trims, wall coverings and carpets. In addition I provide custom window treatments, accessories, lamps and artwork to add the finishing touches to your décor. At Sketches, an interior view LLC, I have extensive experience in commercial design including health care facilities, hotels, offices, clubhouses, restaurants as well as model homes and multi-family apartment and condominium complexes. Drawing upon my knowledge and breadth of experience, I will assist you in creating the spaces you desire while managing the details of the project within your budget. Pricing is based on an hourly rate. I would love to schedule a consultation. I can be reached at 513-484-0663. Neal's Design*Remodel is a Design-Build remodeling company serving the greater Cincinnati, Northern Kentucky and Western Indiana community. Our mission is outstanding quality, exceptional customer service leveraging our remodeling experience. Neal's Design*Remodel has been teaming professional designers with construction experts since 1972. We take pride in our customer's satisfaction and embrace a proven "Signature Process" culminating from years of experience and customer feedback. Neal's Design*Remodel is dedicated to remaining Greater Cincinnati's leading Design-Build contractor. 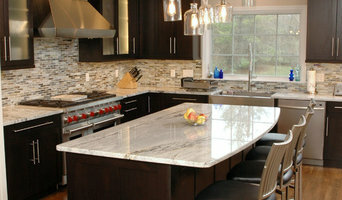 We create value for our clients through innovative design, superior craftsmanship and unparalleled professional service. By addressing and designing around our clients' needs, we produce high quality home additions, kitchens, lower levels, and baths. As a design build remodeling firm, we team together professional designers with construction experts to give homeowners a more complete and positive remodeling experience. The first and most important aspect of design/build remodeling is the key involvement of you, the homeowner. Because of the convenience of working with one firm from start to finish, you enjoy a time-saving "one-stop shopping advantage." In fact, you are the most important member of the design build team. Your ideas and wishes are the focus of the rest of the team. Secondly, you drive the decisions from selecting materials to shaping the project budget. You bring your needs and wants to us and we provide the expertise, skills, and knowledge to make those wishes become a reality. Thirdly, as a design/build firm, Neal's offers you personal assistance in selecting materials, colors, finishes, etc. that not only fulfill your remodeling goals, but also work within your budget and compliment your existing home. Often, we can show you photos of similar projects or unusual solutions from our extensive photo database of previous work. When working with a design/build remodeler such as Neal's, you have the reassurance of knowing that the craftsmen responsible for the building are completely familiar with the design. And because your construction crew works closely with your designer, any changes or questions can be immediately addressed and resolved and often without redesign or re-estimating. Our clients understand this saves time and money. When J.R. Thomas founded his company in 1976, he knew two things: first-rate landscaping and superior customer service. These are still our guiding philosophies. Even as landscaping trends change and we employ new technologies, we still service our clients the old-fashioned way, with personal attention. 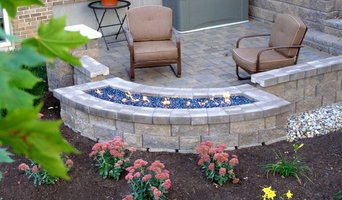 Our wide range of services include design & install, landscape maintenance, unique natural stone and engineered block accent walls, landscape lighting, natural stone and paver patios, stoops, landings and walkways. We use a variety of high-quality plant material that is well suited for the typical greater Cincinnati climate. Not only can we help you coordinate and contract your other projects, such as swimming pools, irrigation, decks and gazebos, we will work closely with your contractor to assure that the landscaping fits seamlessly into the entire visual package. 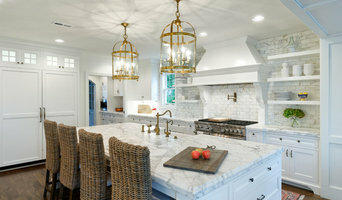 Bauscher Construction & Remodeling, Inc.
Are you drooling over beautiful kitchens and bathrooms on Pinterest and Houzz? Are you desperate for more space in your home? If you are, we can help you Design and Build your dream home. We've been creating beautiful new kitchens and bathrooms all over the Cincinnati area for over 40 years. Here are just some of the projects we've been working on. In Hyde Park we recently remodeled a small non-functional kitchen into an open farmhouse style kitchen with easy access to their outdoor eating area. Here is what our clients had to say: "Even in the relatively short time that we’ve had this remodel, we’ve had folks come to us and say, look we want to do a remodel, who should we use? And without hesitation we say, there’s one name, and it’s Bauscher." Chris S. Another client of ours were looking to remodel their whole condo. They had inherited the condo and wanted to remodel it with aging in place aspects so they could live there long term, but they didn't want to sacrifice form over function. We had a solution for them, and here is what they have to say about their newly designed home. "We were afraid, just afraid to get into it, and Bauscher Construction made us feel really comfortable and led us through the whole project nicely." Christine K. Click the links below to watch the videos below to see both of these clients complete testimonials. <a rel="nofollow" target="_blank" href="https://youtu.be/AqxLgbeQZE8">https://youtu.be/AqxLgbeQZE8</a> <a rel="nofollow" target="_blank" href="https://youtu.be/fRpJXYfUY4Y">https://youtu.be/fRpJXYfUY4Y</a> At Bauscher Construction it's not just about creating a beautiful space or building sturdy walls. We believe in treating people and their homes with respect and kindness. We are a company that delivers not only stunning kitchens and bathrooms but also gives our clients an enjoyable experience. One that keeps them coming back. At Legacy Builders, our customers are our first priority. We’ve spent years thinking through the promises that we can make to you, and we want you to rest assured that when we enter into a contract with you, we make the following assurances: Client Focused It is our promise to you that we will conduct business with great attention on you, your family, your pets, and your neighbors. From the planning and design stage all the way through to the completion of your project your experience is paramount to us. Client Advocacy We will use our years of training, experience and resources to serve you and act as your advocates. We may ask tough questions to help you think through a design or selection decision or counsel you on the best way to remedy an issue with your home whether it takes place before, during or years after the construction of your project. Build to Budget Promise We assure you that what you signed up for on day one is what is delivered to you at project completion. On time and on budget are two things our clients love about Legacy Builders Group. No Hidden Costs We are realistic with you from day one about your goals and your budget and the process it will take to achieve them. Hiding cost or deliberately creating grey areas is not in our DNA. If a hidden or unforeseen condition should arise during the remodeling process, we will have a conversation with you about your options and then you are able to make an informed financial decision. Your Partnership Matters to Us We strive to create a trusting partnership with our clients, which is why we make the above promises to you first. Listening to your ideas, goals and budget and working together through our proven design-build process helps everyone involved to establish trust. You trust us to accomplish your dreams for your home and we appreciate that trust. Give us a call 513-851-2700 today to begin transforming your project ideas into an exciting reality! 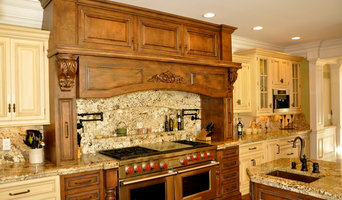 Founded in 2000, we are a leading home design and remodeler based near Cincinnati Ohio. We have succeeded through good and bad economic times due to our quality conscientious work, referrals, and lower overhead than larger remodeling companies. We enjoy getting to know our clients and working closely with them to ensure their remodeling project is completed as they want. Fricke & Company will not be the least or most expensive price; however, we do not cut corners, we show up on time everyday and we do what we say we will do. In one word we are RELIABLE. Thomas Decks is a complete design/build company specializing in custom decks, porches, pergolas, boat docks and all of your outdoor carpentry needs. We use quality products and skilled craftsmanship. 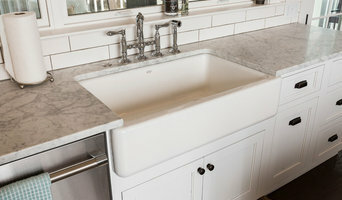 **2019 BEST OF HOUZZ SERVICE AWARD WINNER! ** Vision Construction LLC is a full service custom building and remodeling company with over 20 years experience in the industry. We specialize in complete custom home builds, remodeling of kitchens, baths and basements but also perform many other services for our clients. We are currently completing projects around the entire greater Cincinnati area so if you need a quality contractor that you can trust, please give us a call today. We look forward to exceeding all your expectations and Turning Your Vision Into Reality! I am passionate about design! I believe everyone deserves to live in a beautiful home that expresses who they are! My mission is simply to creatively improve my clients' lives with design solutions tailored to fit their needs! To quote the American Society of Interior Designers: "Design Impacts Lives"! We are North America's leading in-home design floor coverings brand. Our company is carefully crafted on creating for you, our customers, a discernible difference from any other floor coverings company. Our product selection covers all areas of materials you might consider for a flooring design in your home – carpet, hardwood, ceramic tile, vinyl, and specialty products from bamboo to slate, and accents like glass. We merchandise our product selection to give you a beautiful selection from only the finest manufacturers, both from North America and around the world, and we believe it is a selection unmatched anywhere else. Your design associate is someone who will come to your home with the specific skill to design for you the flooring solution to inspire you, and that is perfect for your home. Every one of our design associates is trained to be an expert in both flooring knowledge and flooring design. We are experts in knowing the features and benefits of all types of flooring material, and how to create for you the right design, either from one material, or using several in one design. Our job is to inspire you, and to open up for you a world of opportunity to create the most beautiful and appropriate flooring solution. The Floor Coverings Customer Experience has been crafted to ensure that from the first moment you contact us, through the installation of your floor and beyond, you will feel valued and held by our company. Whoever you talk to and meet at Floor Coverings International, we would like you to know that the measure of our success lies solely in the measurement of your satisfaction of us. Reach out to multiple professionals — especially for larger projects — and don't settle for the first quote you receive. Comparing multiple Cincinnati, OH professionals' quotes and experiences can help you find the one that’s best for you. Ask a lot of questions now, so you won't have unexpected answers later. Find a home design professional on Houzz. Narrow down your search by type of professional and location. Browse Cincinnati, OH portfolio photos, read client reviews and contact each home improvement professional for more information. Check out the information in the specialised professional sections too for tips on how to hire the right professional for your project.